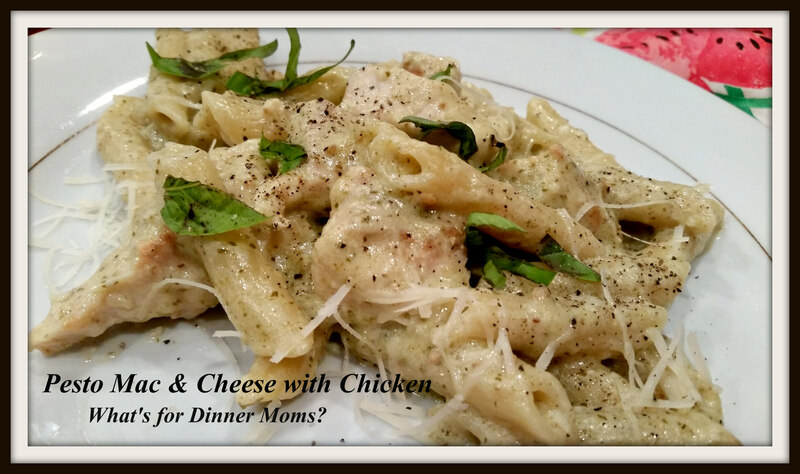 Pesto Mac & Cheese with Chicken – What's for Dinner Moms? Of all the summer/early fall favorite flavors I have to say basil pesto is one of my favorite. This is one of my newly acquired tastes. There are many foods I never tried until I was an adult. Sour cream, broccoli, pesto, and grape leaves to name a few. I love them all now, but they smelled funny and had unfamiliar textures so I would just say I didn’t like them. Salads were iceberg lettuce and salad dressing. Nothing else. I didn’t like peppers, onions, olives or mushrooms. So, for those of you with picky eaters, there is hope. Our CSA has been handing out basil each week so I have been putting it in and on everything. For this dish you can make your own pesto if you like or use a jarred pesto if you prefer. This was a hands down, like your plate clean, hit. The best thing was when my son picked up his plate to lick the last bits of sauce off it. All of us looked at each other, shrugged and liked our plates too! It was funny and something my kids will remember. I served this with green beans and a green side salad. In a large skillet over medium heat warm olive oil. Add chicken and cooked until completely cooked through. Boil water for pasta and cook according to package directions until al dente. In the chicken pan melt the butter over medium heat. Sprinkle flour over the butter and while stirring constantly allow the paste to cook and thicken for 3-4 minutes. Add milk and lower heat to medium low just as the sauce begins to simmer. Stir until sauce is well thickened. Remove pan from heat and stir in chicken, pasta, cheese and pesto until well blended. Return pan to stove top to warm chicken. Once dish is warmed through, taste and adjust salt and pepper as needed. Serve with a topping of fresh basil and shredded Parmesan, if desired. You know it’s gotta be good when the kids literally lick the plate clean! Marci, how many servings do you get from this recipe? If you do the normal 1 cup serving, which we do not, it was about 6-7. Thank you! I ♡ pesto!